In the previous Foundations of Evaluating Public Transit Networks post, I went into detail on the limitations of Qualified Point Utility. I ran through an example that looked at the Qualified Point Utilities at six consecutive minutes, revealing that each of these times yielded very different scores and maps of reachable destinations. Instead of focusing on this observation as a weakness of Qualified Point Utility, this post explores how acknowledging this minute-to-minute volatility results in a better measurement. Before deriving this measurement, it is worthwhile to recapitulate how Public Transit Analytics defines a useful transit network. Such a network allows people to reach their desired destinations at whichever times they wish to travel. While Qualified Point Utility helps to reveal what destinations a person can reach, its minute-to-minute variability makes it incomplete for measuring utility. A better measurement would consider what is reachable in a way that incorporates the rider's desired travel times. People and their lives are unpredictable, though. Even with data that reflects rider behavior, it is important to consider that riders may be behaving in a certain way not because they desire to, but because the existing transportation systems limit them. 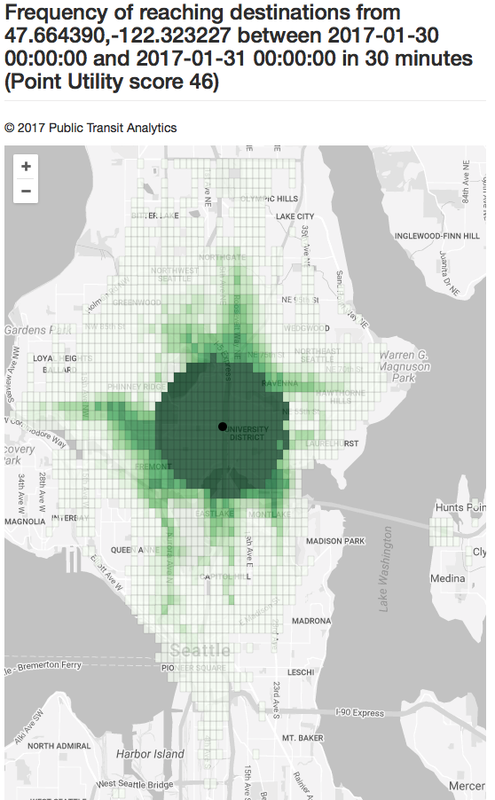 Therefore, Public Transit Analytics chooses to measure how useful the network is in an aspirational way: measuring how close the network is to allowing a person to reach every Sector at all times of day. Some assumptions must be made to make this tractable. Transit schedules tend not to vary considerably within days of the same type (weekdays, Saturdays, Sundays, and holidays). Thus, scores can be computed for single days that are chosen as representatives of each type. For the purposes of this derivation, January 30, 2017 is selected to represent all weekdays. With the representative day selected, a virtual rider starts their voyage at each minute of the day-long time span. For each of these voyages, the Score Generator computes which Sectors can be reached within a fixed duration—in the case of this example, 30 minutes. The number of reached sectors in each of the computations is summed. This sum is divided by the total number of reached sectors that would be achieved by a perfectly comprehensive transit network: the product of the number of measurement times (1440 for a full day) and the number of sectors on the map. Like Qualified Point Utility, this ratio is multiplied by 1000 and rounded to an integer for readability. This measurement is referred to as simply Point Utility, as the time qualifier has been dropped (note the lack of a superscript time in the formula). Though the formula does simplify to the average of all the Qualified Point Utilities in a time span, writing it this way attempts to frame the measurement in a way that captures a rider's experience on the transit network. Riders are unlikely to think about how well their network scores in Qualified Point Utility at each minute of the day. By explaining the measurement as counting up reachable Sectors at each time of day, it is more clear that it measures something useful to riders. Because Point Utility is derived from isochrone maps, it lends itself to visualization. Consider each time in which a Sector can be reached as adding a thin layer of green pigment over the Sector. Deeper shades of green thus indicate that the Sector is reachable at more times in the day-long time span. The areas with the deepest shade, as seen in the roughly circular area around the starting point, are typically those that can be reached by just walking. The map below uses the day of January 30, 2017 as its time span and measures how often one can reach Sectors in a 30 minute duration from the Public Transit Analytics office. On the interactive map, hovering over the Sector reveals the percentage of times of day when the Sector can be reached. Clicking on a Sector shows the paths to the Sector, and the percentage of the day that this path is the fastest way. Transit planners can create these maps for individual riders with concerns about their transit network, centering the map on the rider's home or work. They can explain that areas with deep shades of green are ones that the rider can reach without preplanning, as ways to reach them exist throughout the day. From there, the rider can explain the ways in which their experiences match or do not match what the map indicates. Internally, planners can use the scores to evaluate whether a change that they are making has a generally beneficial or deleterious impact on a neighborhood or individual constituent. Because Point Utility scores are on the same scale as Qualified Point Utility scores, the utility of the network at a single time of day can be compared with the network as a whole. This can be useful when trying to quantify the difficulty faced by a person who needs to use transit at atypical times. Though Point Utility represents a considerable improvement in measuring the overall utility of a transit network, it is limited by the fact that it is centered at a single point. As this series of posts continues, I will address that limitation, while also delving deeper into the uses of Point Utility. Interested in using Point Utility measurements to improve the transit agency that you represent or use? Contact matt@publictransitanalytics.com to schedule a consultation.